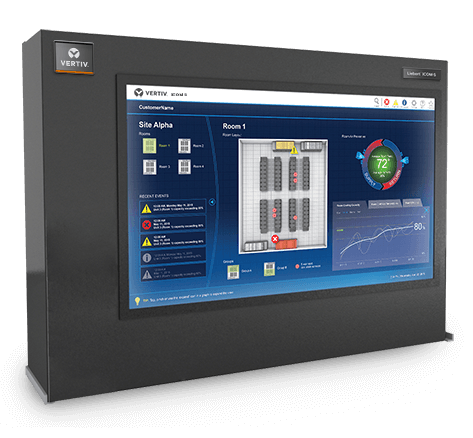 Liebert iCOM-S Thermal System Supervisory Control allows you to manage and control your entire data center cooling system for up to 50% higher efficiency, improved protection and greater productivity. Liebert iCOM-S provides a single point for managing your entire cooling infrastructure and gaining quick access to actionable data, system diagnostics and trending. The Liebert iCOM-S is part of the Liebert iCOM family of thermal monitoring, management and control solutions, which also include the Liebert iCOM unit control and iCOM CMS monitoring and management system for remote edge computing and other small IT spaces. The Liebert iCOM-S system is a single point for centralizing thermal data from sensors and cooling units, unlocking the benefits of machine-to-machine communications to harmonize and optimize thermal system performance across the data center. This prevents cooling units from working at cross-purposes and allows the system as a whole to efficiently adapt to changes in data center capacities to improve availability and energy efficiency. Liebert iCOM-S operates on an all-in-one, touch screen computer that mounts virtually anywhere, providing quick access to actionable data and system diagnostics and trending.